2008 DODGE RAM 2500 SERIES QUAD CAB 4X4 ''CUMMINS DIESEL'' IN EXTREMELY GOOD CONDITION WITH FACTORY SLT BIG HORN PACKAGE, PREMIUM SOUND SYSTEM, FACTORY POWER SEAT, POWER WINDOWS AND LOCKS, TRAILER TOW MIRRORS, HEAVY DUTY SUSPENSION, SPRAY-IN BEDLINER, TRAILER TOW HITCH, AUTOMATIC TRANSMISSION, ''6.7 LITER CUMMINS TURBO DIESEL'', FACTORY BIG HORN UPGRADE ALUMINUM WHEELS, CLEAN CARFAX REPORT AND RUNS AND DRIVES PERFECT! PLEASE TAKE NOTE...... THIS CUMMINS DIESEL HAS BEEN PROFESSIONALLY UNDERCOATED SINCE IT WAS NEW!! THE FRAME HAS ''ABSOLUTELY NO RUST OR ROT'' THE FENDERS AND QUARTER PANELS ARE ALL ORIGINAL AND ARE FREE OF RUST AND ROT AND HAVE NEVER BEEN REPAINTED OR REPLACED!!! 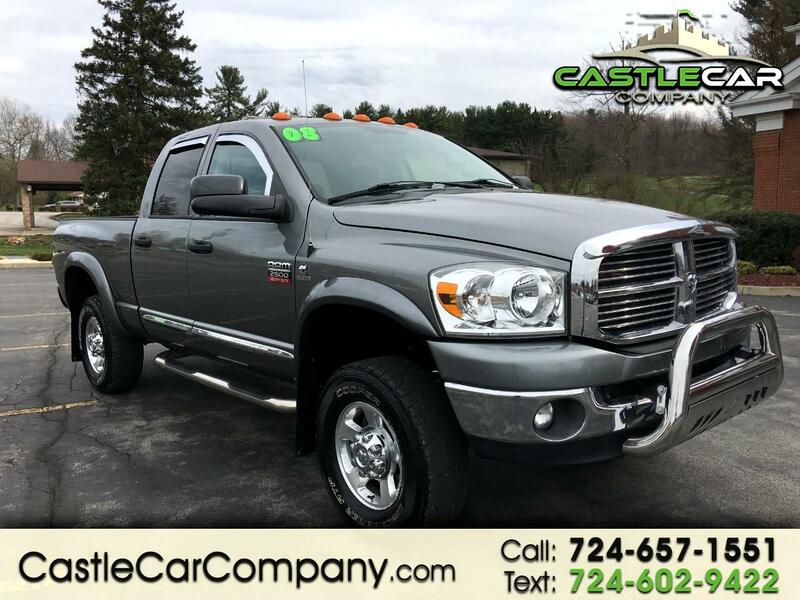 THIS TRUCK HAS BEEN EXTREMELY WELL KEPT AND MAINTAINED THOUGH ITS LIFE AND LOOKS IT!!! PLEASE CALL FOR MORE INFO OR A WALK AROUND ON THIS TRUE GEM!!! 1866-717-1432 OR DIRECT @724-657-1551 TEXT US @ 724-602-9422 YOU FOUND THE HOLY GRAIL!